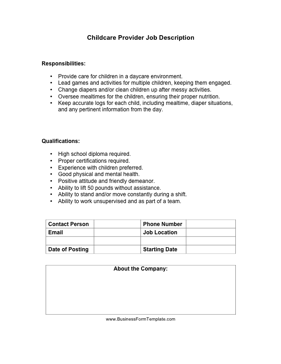 Great for new hire teachers and staff, this childcare provider job description outlines educational requirements and job responsibilities for nurseries and early development programs. Provide care for children in a daycare environment. Lead games and activities for multiple children, keeping them engaged. Change diapers and/or clean children up after messy activities. Oversee mealtimes for the children, ensuring their proper nutrition. Keep accurate logs for each child, including mealtime, diaper situations, and any pertinent information from the day. Positive attitude and friendly demeanor. Ability to work unsupervised and as part of a team.